A Ukrainian crime gang used offshore firms in British tax havens to secretly invest millions of pounds in the UK, a BBC Panorama investigation has found. The gangsters, and in some cases family members, bought luxurious property in prime London locations, including a £12.5m flat. The daughter of a man dubbed the "Don of Odessa" is the registered owner of three homes in one expensive block. Many of the revelations come from the Paradise Papers data breach. The gang were from the Black Sea port of Odessa and made money in the oil industry. They came on to the police's radar in the late 1990s when they were suspected of drugs and arms smuggling. In the chaos following the collapse of the Soviet Union the gang branched out into Europe, using Italy as a base. But police were on to them. For four years specialist anti-mafia officers tracked their movements across the continent. They tapped their phones and what the men discussed was chilling, police said. "They described murders that were particularly cruel. 'I kept hitting his head until it broke... I killed him with many blows,'" recalls Italian state police Deputy Commissioner Nunzia Savino. "They were extremely violent." The gang was organised along strict mafia lines with each member assigned a role. Nickolay Fomichev, described as a "violent and armed person"
Despite evidence from the phone taps, most of the gang members were never charged because their crimes were not committed in Italy. Eventually, the anti-mafia investigation was wound up. Mr Trukhanov returned to Odessa to begin his political career, Mr Angert settled in London while Mr Fomichev is believed to have moved to Belgium. Like many other investors looking for a solid return on their capital, the gangsters saw a promising opportunity for their cash in the London property market. The men kept their names off public records by using offshore companies registered in the British Virgin Islands (BVI), where it was possible to be an anonymous owner. Mr Angert controlled a company called East Corner Properties set up in the BVI. It bought an apartment in an expensive Victorian block in Kensington where the poet TS Eliot once lived. In 2001 another offshore firm, Matelot Real Estate Incorporated, paid just over £1m for a flat in a shiny new tower block on the River Thames across from Chelsea Harbour, which it sold in 2006. We don't know who was originally behind it because when it was set up Matelot had nominee directors and an anonymous owner. But thanks to the huge Paradise Papers data breach, we do know in 2010 the ultimate beneficial owner of Matelot was Nickolay Fomichev, a member of the gang. In a joint investigation with the Organised Crime and Corruption Reporting Project, Panorama has delved into documents from Appleby, the offshore services provider at the heart of the Paradise Papers. The documents were originally obtained by German newspaper Suddeustche Zeitung, which shared them with the International Consortium of Investigative Journalists, the BBC and nearly 100 other media partners. In December 2015, the Appleby Group's offshore fiduciary and administrative service business separated from its legal division to form a group of new companies called Estera. Appleby and Estera are now separately owned businesses. As well as revealing Mr Fomichev's connection to Matelot, the Paradise Papers show two other flats in the building were owned by another offshore company linked to the gang. Mr Fomichev's name crops up in connection with more property a couple of miles north of the river in one of the world's most affluent areas. Number 199 Knightsbridge resembles an expensive hotel, with security and staff manning the entrance. Are we taming offshore finance? Two apartments in the building were bought by offshore companies called Brightside Properties Number 3 and 4. The numbers don't relate to the flat numbers. Documents show by 2010 both companies were owned by Mr Fomichev, who is now believed to be dead. In 2015 Brightside sold the flats to a young budding film-maker named Anya Angert. She is the daughter of the Don of Odessa. 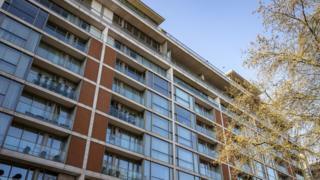 The purchase price for just one of the flats was £12.5m. It is unclear how Ms Angert was able to afford it, but she now owns a total of three flats at 199 Knightsbridge. We have also discovered that a fourth flat in the block was linked to the gang. Donald Toon, director of the National Crime Agency, said the case "certainly gives me cause for suspicion... that there is money laundering taking place". "What we need to do in these circumstances is to be able to be clear how much of that material is capable of being used in court as evidence as it stands," he added. Establishing offshore companies needs help from professionals. London accountant Alexander Popivker, working from an office in Finchley, set up and administered dozens of offshore companies - known as the Rubicon Group - with the help of Appleby. Some of these companies were used by the gang from Odessa. To guard against money laundering international firms like Appleby are required to carry out rigorous checks on all their clients. But they can allow other professionals to conduct due diligence checks for them. They made Mr Popivker an "eligible introducer", which meant he could bring new businesses into the Appleby fold and vouch for their owners. It is legal. But for the system to work the introducer has to be thorough and independent. Mr Popivker is married to the sister of mafia boss Alexander Angert. Money laundering checks should be especially thorough when a company is owned by politicians or politically exposed persons (PEPs). The Paradise Papers show Gennadiy Trukhanov had a major stake in four offshore firms that were administered by Appleby. For years, Appleby seemed unaware that he had become a PEP. When it asked Mr Popivker about the money, he told Appleby "Gennadiy Trukhanov is unknown to us". But documents in Appleby's own files suggest this was not true. When Panorama caught up with Mr Popivker, he denied dealings with the mayor, saying he had "never dealt with him in any capacity". Mr Popivker later told us: "At no time and under no circumstances did my company or I personally engage, either historically or currently, with a client or group of clients where the clients' integrity, activities, sources of their funds or the nature of proposed transactions were in any doubt as to their legitimacy of legality." Mr Trukhanov is currently under criminal investigation in Ukraine. Last October his home and offices in Odessa were raided. In February he was arrested and accused of embezzlement in Odessa but was allowed to carry on as mayor. 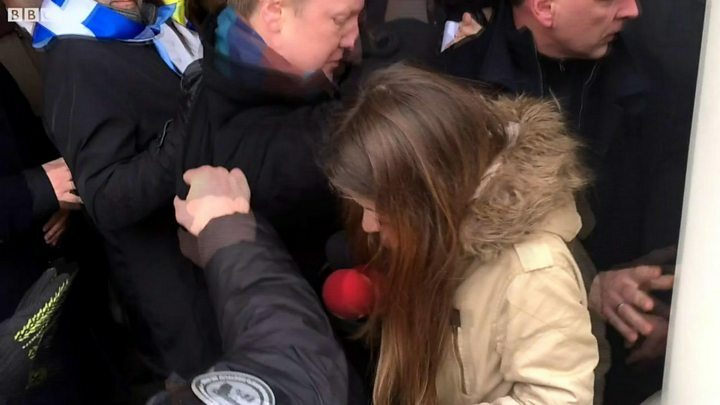 "We suspect the mayor of Odessa of stealing money from the city of Odessa," said Nazar Kholodnytskiy, Ukraine's special anti-corruption prosecutor. Mr Trukhanov denies the allegations. He also denied all of Panorama's claims, saying the programme was putting out false information which "undermines his honour, dignity and reputation". Appleby has been in the firing line in the past. For almost 10 years, the offshore service provider's BVI office failed to notice it was setting up and administering some companies that were being used by gangsters to launder money. In February 2009 a compliance manager pointed out that Appleby BVI was not running adequate checks on companies. The same report pointed to a company set up by Mr Popivker as an example of where proper checks had not been carried out. In 2011, an Appleby employee noticed serious problems in the record keeping for Mr Popivker's companies. Local regulators also picked up on problems in Appleby's BVI office. In 2012 the BVI Financial Services Commission (FSC) found there was missing compliance documentation. In 2013 the commission wrote to the group managing partner of Appleby about "continued and significant regulatory deficiencies" and in 2014 concluded Appleby BVI had broken money laundering rules. Appleby says that "whilst it is correct that the 2014 FSC Report identified certain areas of improvement, Appleby had by that time already taken a number of corrective actions." It says the documents we are using were stolen. Appleby BVI finally parted ways with Mr Popivker in 2015 after the BVI's Financial Investigation Agency demanded to know who was behind one of the companies he was acting for as part of a money-laundering inquiry. Appleby says it was legally entitled to rely on Mr Popivker to carry out due diligence and stopped using eligible introducers in 2015. In the same year the 60-plus companies in the Rubicon Group were moved to a different offshore provider. Transparency International, which assisted in the investigation, says it is far too easy for criminals to bring dirty money into the UK. "Corrupt individuals cannot steal public funds unless they have a getaway vehicle and then a safe place to stash their stolen loot," said its head of advocacy, Rachel Davies Teka. "And anonymous companies are the getaway vehicle and UK assets, such as property, are the safe haven." Shadow chancellor John McDonnell says the UK has become the money laundering capital of the world. "Our reputation is being damaged by it... There's been too many examples over years of dirty money coming into the city and by allowing this to happen we are almost aiding and abetting these criminals," he said. The government has promised to introduce a public register to reveal the true owners of UK properties owned by offshore companies. Security and Economic Crime Minister Ben Wallace said he is determined to stop money laundering. "We will come for them, for their assets and their money. I am determined that we use all the powers we have, including the new powers in the Criminal Finances Act, to counter the threat from illicit funds." The powers include unexplained wealth orders, which allow assets to be seized where the source of funds is suspicious. The National Crime Agency said the orders could potentially be used to seize some of the London flats linked to the Ukrainian gang. Find out more about the words and phrases found in the Paradise Papers. The Paradise Papers is huge data breach mostly from the former offshore services provider Appleby, along with corporate registries in 19 tax jurisdictions, which reveal the financial dealings of politicians, celebrities, corporate giants and business leaders. The 13.4 million records were passed to German newspaper Süddeutsche Zeitung and then shared with the International Consortium of Investigative Journalists (ICIJ). Panorama has led research for the BBC as part of a global investigation involving nearly 100 other media organisations, including the Guardian, in 67 countries. The BBC does not know the identity of the source. In a statement on the Paradise Papers, Appleby said it was a law firm which operates in jurisdictions regulated to the highest international standards and "advises clients on legitimate and lawful ways to conduct their business".